Are you considering a 401k hardship withdrawal from your current employers 401k plan? This is a complete guide (start-to-finish) on necessary steps, what to expect, and useful tips to taking a hardship withdrawal from your 401k plan. Do You Qualify for a 401k Hardship Withdrawal? The IRS explicitly defines requirements for the hardship rule based on any of the following. After meeting the IRS requirements, you must meet your employer and 401k provider requirements. Your employer reserves the right to turn down a hardship request, since they pay you directly and have a level of understanding of your financial situation. Your employer might recommend other financial alternatives (advanced pay, IRA, pension) before allowing you access to your 401k, however this seems unlikely in most situations. Note: Some 401k plans allow you as participant to communicate directly with them versus having to communicate through an employer HR partner. Remember, your employer HR partner will still need to sign off on a hardship withdrawal no matter what – so failing to keep them informed throughout the process could potentially delay your hardship distribution. Finally, you will need to submit a paper/electronics request to your 401k provider requesting a hardship withdrawal. The form is straightforward, however there are important points to mention. An example request for hardship withdrawal form is displayed below. *Your hardship eligibility amount cannot exceed the total amounts on your provided hardship documentation. You will only be able to withdrawal the amount equal to or less than your total hardship request. *It is highly recommended to have State and Federal tax withheld automatically from your hardship distribution. If you decide not to withhold taxes, depending on how much you withdraw, you will be slapped with a large payment to the IRS come end of the year for tax filling – including the 10 percent early withdrawal penalty. Save yourself now and have taxes withheld! Check this box on your form. *You will need to pay 401k processing fee(s) from your 401k provider. These are typically not much, but no more than $100. *Your 401k provider will suspend your 401k plan for a minimum time period in lieu of taking your hardship withdrawal. During this time, you cannot contribute to your plan. In addition, the hardship withdrawal counts as your maximum of one withdrawal for the year from your 401k. Your 401k plan provider will require copies showing proof of claims as well as follow up with any person(s) or companies to validate documents. Document verification and approval process by the 401k provider can take up to a month or more. It is recommended to have your 401k hardship withdrawal deposited via ACH (Automatic Clearing House) so you can receive your hardship funding immediately after approval. 401k plans should allow deposit by ACH. I am Approved for a 401k Hardship and Submitted Everything. What Now? Once approved and signing off on your 401k hardship, your deposit should appear in your bank account shortly thereafter. You won’t need to wait for your employer payroll to receive your funding. Once funded, you will be able to use the hardship funding however you choose. You will not need to provide further documentation for showing how you spend the funding. What Happens at the End of the Year for Tax Time? Your 401k provider will send you a 1099-R in the mail that outlines your hardship withdrawal amount, taxable amount, a distribution code, and other information. If you decided to not have taxes or the 10% early withdrawal penalty withheld, you will have a 1099-R very similar to the below. 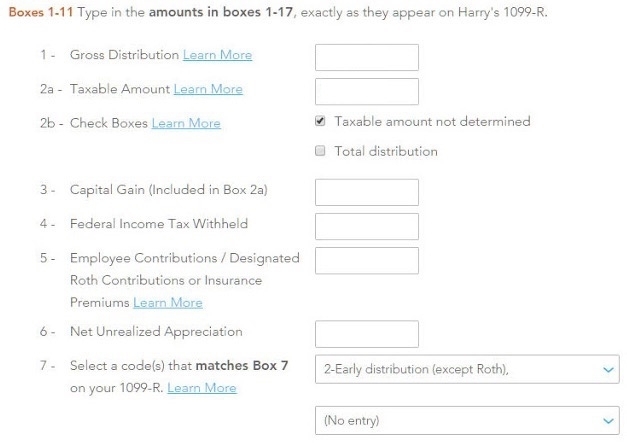 The most important box on your 1099-R will be your Distribution Code. This code tells the IRS why your hardship was distributed and how taxes will be classified on it. Most hardships are classified 1 – early distribution, no known exception. The 1 code is taxed at a regular rate with the early 10% penalty. A full list of 1099-R distribution codes are found below. 4 Death – regardless of the age of the employee/taxpayer to indicate to a decedent’s beneficiary, including an estate or trust. Also used for death benefit payments made by an employer but not made as part of a pension, profit-sharing, or retirement plan. 5 Prohibited Transaction – This generally means the account is no longer an IRA. R Recharacterized IRA contribution made for 2014 and recharacterized in 2015. W Charges or payments for purchasing qualified long-term care insurance contracts under combined arrangements. If you use TurboTax, you simply copy the boxes into their form. An automatic calculation on what you will owe or receive will display immediately. 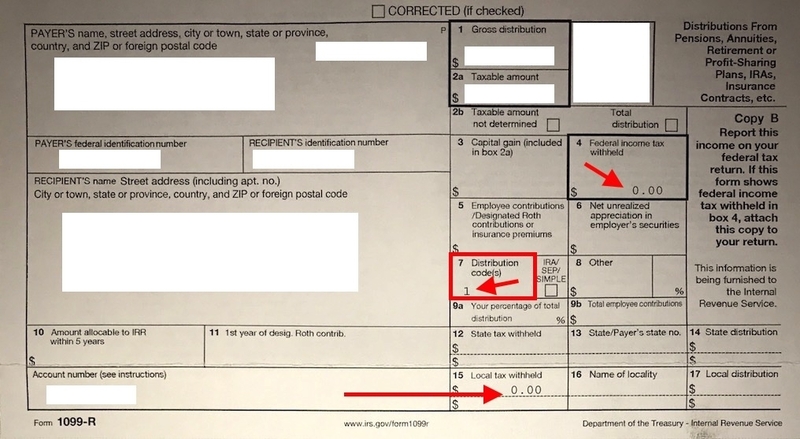 Remember to copy all 1099-R boxes exactly as they appear. Failure to do so will trigger red flags on the IRS systems once you submit your tax return – so be sure to fill in everything!